5/9 Cup of Coffee: A day after a bunch of doubleheaders, the Greenville Drive picked up their game from Saturday that was suspended in the fifth inning, before also playing their regularly scheduled game. 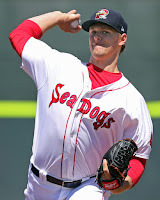 Justin Haley (pictured) dominated in his outing for Portland, and Jalen Beeks pitched well for Salem. Rafael Devers and Josh Ockimey drilled home runs, while Mike Meyers had a huge day at the plate for Salem. Eduardo Rodriguez took the loss while making his third rehab start. He lasted 5 2/3 innings and allowed six hits and three runs, including two home runs. He walked one and struck out just two. His next start could come for Boston. Kyle Martin provided 3 1/3 perfect innings of relief with three strikeouts. The PawSox offense didn't do much, recording just two hits. Justin Maxwell tied the game in the fourth inning with a two-run homer, but that was it for the offense. Chris Marrero had the other hit, and Sandy Leon drew two walks. 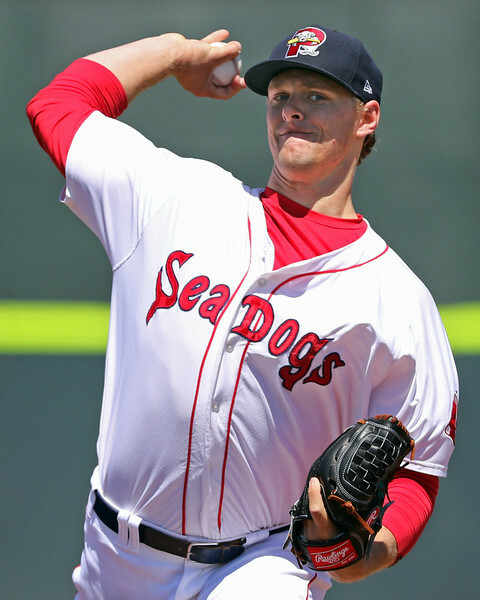 A four-run second inning and a great outing from Justin Haley was enough to push the Sea Dogs to victory. Haley went seven innings without allowing a run. He surrendered just four hits, walked two, and struck out five. Chandler Shepherd ran into some trouble in relief, allowing three runs in the eighth inning, but he was able to hold off Reading in the ninth to seal the win. Portland did all of its scoring in the second inning, as Ryan Court, Derek Miller, and Tzu-Wei Lin had consecutive RBI singles in the frame. Miller also walked twice and Aneury Tavarez went 2 for 3 as well. Salem jumped out to an early lead in the second and never looked back. Danny Mars stole home as part of a double steal with Mike Meyers to start the scoring. Meyers later scored on an RBI single by Bryan Hudson. Meyers and Rafael Devers each added home runs later in the game. Devers finished 2 for 4 with a walk. Mauricio Dubon went 2 for 5 with a double, triple, and two RBI. David Sopilka also had a nice day, going 2 for 4 with a triple and two runs. Andrew Benintendi added an RBI double. Jalen Beeks grabbed his fourth win of the season, tossing six innings, allowing three runs (two earned), on five hits, two walks, and four strikeouts. Jamie Callahan and Taylor Grover combined for three scoreless frames, with Callahan taking the seventh and eighth and Grover pitching the ninth. Play resumed in the fifth inning with the Fireflies already holding a 5-0 lead. All they did was tack on and go on to win 13-3. They were all over Drive pitcher Kuehl McEachern, who started the sixth inning and gave up six earned runs. Dioscar Romero came on to throw two innings and allowed two runs (one earned). Anyelo Leclerc tossed a scoreless ninth inning. When play resumed, the Drive picked up a pair of runs in the fifth on an RBI double from Roldani Baldwin and an RBI single from Joseph Monge. Monge, Baldwin, and Tate Matheny each finished the game going 2 for 4. In the second game, scheduled for seven innings, the Drive broke a 4-4 tie in the bottom of the sixth on an RBI double by Joseph Monge. Josh Ockimey hit a go-ahead two-run homer in the third inning, his sixth home run of the season. Ockimey also added an RBI single and Chad De La Guerra ripped an RBI double. Tate Matheny stayed hot in this one as well, going 2 for 3. After tossing two scoreless innings to open the game, Drive starter Daniel Gonzalez ran into trouble in the third. He allowed three runs in the frame and four overall in just 3 1/3 innings. He gave up eight hits, walked two, and struck out five. Jake Cosart picked up the win in relief by throwing 2 2/3 shutout innings with three punch outs. Bobby Poyner earned his sixth save with a perfect ninth to lower his season ERA to 0.56. Player of the Night: Mike Meyers has had a down year so far for Salem, but he came up huge in Salem's 8-3 win. He went 3 for 5 with his second home run of the season. He also stole a base, his fourth of the year. The 2012 12th round selection is now hitting .229/.298/.349 for the season.